At present time the growth of aviation is very high and the growth rate is 29%. India is the third largest aviation market in the world. Aircraft Maintenance Course is a license program and the duration is three year this program is regulated by Directorate General of Civil Aviation (DGCA), Govt. of India. The scope of Aircraft Maintenance Engineering (AME) in India is good. At present time India have approx. 400 commercial aircraft but since 2027 the figure of aircraft is 2,100. So, we all know every aircraft need a regular maintenance and which is done by an Aircraft Maintenance Engineering (AME). An AME is responsible for the safety, security and maintenance of an aircraft and in other words we can say that an AME is responsible for fit to fly. If these figures have done than there are lot of vacancies are in aviation sector in which AME is also include. In AME jobs, only those are eligible who complete their academic program in AME institutes and also complete their training program. 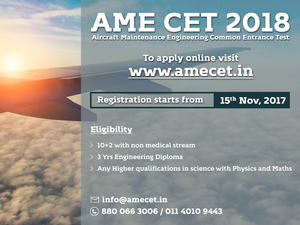 The salary of an Aircraft Maintenance Engineering (AME) for fresher is 6 to 10 lakhs per annum.